In my last post, I shared some chocolate candy which I was quite proud of. What I didn’t share were some of the finer (read slightly disastrous) details of the candy making process. Mainly the ‘melting chocolate’ part. 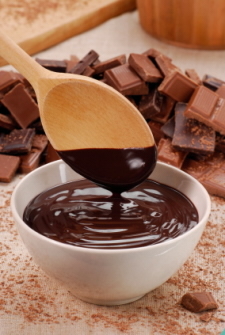 Melting chocolate can be tricky- whether in the form of chips, buttons or finely chopped cooking chocolate. The mixture can coagulate and thicken into a mess quite easily if you don’t do it right. While I was trying to melt my first batch of chocolate, it coagulated and I couldn’t rescue it. A sad waste of three-fourths of a cup of good quality dark chocolate chips! So to avoid what happened to me, I thought I would post a few tips here. 1. Use a double boiler. If you do not own one (I don’t either,) then you can use a DIY boiler by placing a bowl or cup above a saucepan with water in it. Here’s how. 2. Use gentle heat. With chocolate, you don’t want to get the pan too hot. Chocolate scorches easily, so the water in your double boiler needs to be on a simmer, not boiling and bubbling like the witches’ cauldron from Macbeth. If you are using a DIY double boiler, the bowl or cup should not directly touch the water. 5. Get a tutorial if you can! If you are melting chocolate for the first time and are unsure, ask someone, read a tutorial or watch a step-by-step video. I should have done this before I started on my first batch! Here’s a youtube video I found from Epicurious which will help. Now you can melt away!